This webinar on technical analysis will provide you the information on “Analysis that works.” An extremely small proportion of the active market members veritably and persistently generate returns from financial markets. This perfectly designed session on technical analysis will enable the participants to gain an understanding of the practical application of the various concepts of technical analysis, and trading strategies in the financial markets in order to generate consistent returns. This session will be followed up by a Q&A session, the dates of which will be announced later and will be duly informed. This session will provide detailed knowledge on the practical applications of various technical analysis patterns in a concise manner. They will also gain knowledge of various free technical analysis software and websites. Mr. Nooresh Merani is an IT Engineer for Mumbai University by qualification and now a blogger /advisor/educator/trader by profession. He is also a SEBI Registered Investment Adviser. Mr Merani is a blogger for last 10-12 years - www.nooreshtech.co.in with Technical Views on Indian Equity Markets, Global Indices, Commodities and more. 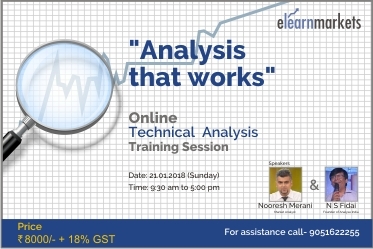 He has trained more than 2000 participants on Technical Analysis over the last 10 years with training sections across Indian metros and even other cities like Indore, Surat, Ahmedabad, Pune. Mr. N S Fidai is the founder of Analyse India. He envisioned technical analysis as a medium to empower traders and investors with the knowledge to make informed investment decisions. His passion to share his knowledge with keen learners led to Analyse India to foray into the field of education. An ex–Banker with 13 years of experience in the Banking sector, Mr Fidai has an illustrious track record of 25 years plus in the Indian Equity markets, having started off in 1991. In the last 6 years, Mr Fidai has honed his skills in the art of Technical Analysis and emerged a successful Technical Analyst par excellence. Please organise more of such webinars on practical aspects of stock trading with system on live market. It would have been very interesting if we covered more recent examples like lupin, reddy's for stock analysis since most of the investors remember whats going on in those stocks.